No more spills in your bag. The patented screw cap and lid design ensures a secure airtight seal. 100% health safe materials, free of BPA, BPS, phthalates, and other harmful leaching chemicals. Made of flexible, shatterproof silicone, Nomader bottles are tough enough to survive those accidental drops. Designed with unique features and vibrant colors, the Nomader bottle was crafted to look as good as it performs. In between sips, the hinged cap doubles as a hygienic spout cover, preventing germs from getting onto the mouth piece. Lightweight and flexible, the 740mL capacity Nomader bottle handles hot or cold drinks, can be frozen and is dishwasher safe. Maintains sturdy shape for a comfortable drinking experience, yet conveniently folds up or squishes down for compact travel. We fully stand behind our water bottles. As rare as they may be, any and all defects are fully covered under our lifetime warranty. 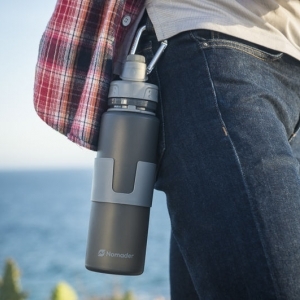 The uniquely portable Nomader® Collapsible Water Bottle makes it easy to stay hydrated while traveling. Designed with a flexible BPA-free silicone body, the travel-friendly Nomader® water bottle can be folded-up or collapsed flat to save on space, yet it’s as comfortable to drink from as a hard-sided bottle. Made of thick, flexible BPA-free silicone, the Nomader water bottle maintains its sturdy feel for a comfortable drinking experience, yet conveniently rolls up or collapses flat when space is tight. Attached strap secures the bottle in its folded position and makes it easy to carry when you're on-the-go. Featuring a rigid plastic sleeve that surrounds its flexible silicone body, Nomader offers a drinking experience that’s as comfortable to use as a hard-sided bottle. Unlike other foldable or collapsing containers that are flimsy and awkward to handle, the Nomader bottle is uniquely designed to remain sturdy as you drink from it. The patented screw cap design ensures a secure, airtight seal when closed and controlled intake when open. In between sips, the hinged cap doubles as a hygienic spout cover, preventing germs from getting onto the mouth piece and into your drink—handy for when traveling, hitting the gym, hiking, or for your kids at school. Built for ruggedness, the Nomader Collapsible Water Bottle can handle extreme temperatures, making it safe for hot drinks or to freeze. The container is made of impact resistant silicone, which is tough enough to survive those accidental drops. The Nomader water bottle was designed and rigorously tested for health conscious consumers. Made of 100% food grade materials that are free of BPA, BPS, lead, PVC, phthalates and other harmful leaching chemicals. We proudly stand behind the quality of every Nomader bottle we sell. To show our commitment to quality, we offer a limited lifetime warranty that covers the repair or replacement of manufacturing defects for the lifetime of the bottle. To learn more about our warranty policy and file a claim, visit our Lifetime Warranty page. We also offer a 100% satisfaction guarantee. If you're not fully satisfied with your Nomader bottle, simply return it to us within 90-days for a full refund. Please contact us for return instructions. The award-winning Nomader water bottle comes in a variety of vibrant colors to match your style, backed by our 100% satisfaction guarantee. Makes a unique gift for friends, family and co-workers who enjoy travel and an active lifestyle. Nomader® Collapsible Water Bottles are available internationally with free 2-day shipping for Prime members at the Amazon marketplaces listed below. For promotional logo imprinting, visit our Co-brand page. For wholesale ordering, visit our Wholesale page. Learn more about Nomader® by visiting our FAQs for answers to common questions. For tips on using and caring for your Nomader® bottle, visit our Help page. If you don't find what you're looking for on our Help page, Contact Us for assistance. Want to register your bottle or make a warranty claim? Visit our Warranty page. Customize Nomader® bottles with your imprinted corporate logo. Visit our Co-brand page. Interested in retailing the Nomader® Collapsible Water Bottle? Visit our Wholesale page. Seeking product donations for your next event? Visit our Donations page. Interested in a marketing collaboration? Visit our Influencers page. Looking for product samples or media assets? Send us a request through our Media form. Looking to do a gear review or story on Nomader? Please provide your details below and we will get back to you as quickly as possible (typically within 1 day). Please complete this brief customer support form and we will get back to you as quickly as possible (typically same day). If you'd prefer to speak with us, call 1.800.213.7052. *If you bought your bottle(s) on Amazon, you can find your 17-digit Order ID within "Your Orders" when logged in to your Amazon account. Nomader® (nomad'er) was founded by Bryan, a frequent traveler and digital nomad who became frustrated with the lack of quality hydration products made for travel. Determined to find a solution, Bryan invested his savings to create an innovative, high-quality reusable water bottle that travelers would love. Made of thick, flexible BPA-free silicone, the Nomader Collapsible Water Bottle maintains its sturdy shape for a comfortable drinking experience, yet conveniently rolls up or squishes down when space is tight. Nomader bottles are leak-proof, shatter-proof, dishwasher safe, and freezable. Launched in 2016, the Nomader® Collapsible Water Bottle has become a top-selling travel accessory for jet-setters, road trippers, traveling families, backpackers, and business travelers alike. From its extreme portability to its leak-proof cap and unique design, the Nomader® is your ultimate hydration companion for travel and adventure. NOMADer where you go, it helps keep you healthy and hydrated. Stay tuned for new and improved variations of the Nomader® bottle, as well as other innovative travel products and accessories being developed. Sign-up for our e-newsletter (lower right side of the page) and/or follow us on Instagram for announcements of product launches and special offers. Does water flow easily or do I have to squeeze? The spout of the bottle is about 1 inch in diameter so water flows fairly quickly. To illustrate this, if you turn the filled bottle upside down with the spout cover open, all 25 ounces of water will drain in about 15 seconds. With forceful squeezes of the silicone body, it will drain in as little as 4 seconds. With moderate squeezes, it will drain in 8-12 seconds. We recommend gripping your bottle with the hard plastic sleeve and pressing down as needed on the silicone body with your finger to increase flow. Can the bottle's twist cap be opened and closed with 1 hand? Yes, the easiest way is to grip the base of your bottle in between your legs and use your free hand to twist open/close the cap or lid. Alternatively, if the bottle is in its upright position on a flat surface, apply downward pressure on the cap as you twist open/close. What is the purpose of the rigid plastic sleeve? Since most collapsible cups have little to no structure, you can expect them to flop around as you drink. Not only does it make for an awkward drinking experience, but if you’re not careful, the flimsiness can lead to spilling water all over yourself. Nomader's hard plastic sleeve surrounds its soft silicone body, ensuring that the bottle won't be collapsed in your hand as you drink from it. The sleeve also insulates your hand from hot drinks and condensation from cold drinks. How hygienic is this travel water bottle? 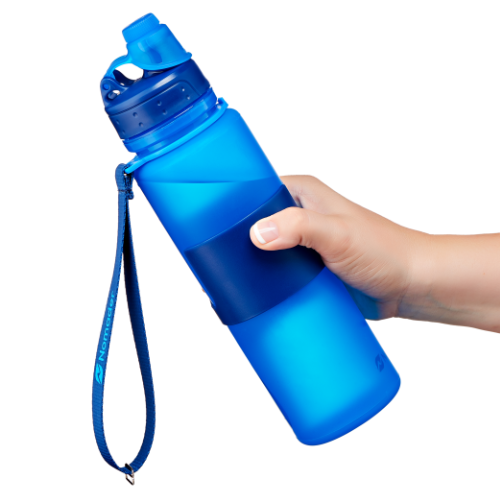 With many reusable water bottles, the mouthpiece is exposed and requires you touch with your fingers to operate. This isn't very hygienic, especially in germ-ridden places like airports, airplanes, and gyms. With Nomader, you simply lift the hinged cap cover to access the mouthpiece, then lower the cap cover when finished sipping. This shields your bottle from germs and grime. Is it flimsy and awkward to drink from? 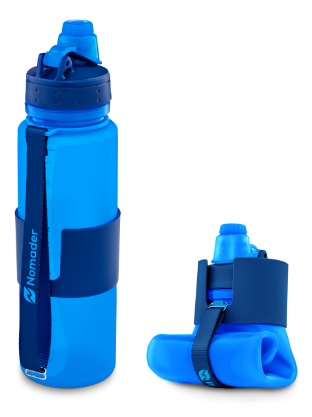 Unlike most flimsy foldable water bottles on the market, you’ll find the Nomader offers you a drinking experience that feels similar to sipping from a rigid drink bottle, yet it can still fold up for compact travel. The thick silicone body has a sturdy feel to it and can stand on its own whether filled or empty. The hard plastic sleeve adds extra stability, insulation, and drinking comfort. Any issue using this foldable drink bottle for air travel? Designed for travel, the Nomader collapsible water bottle is carryon approved to pass through TSA or other airport security. Just be sure your bottle is empty of any liquids until after you exit security, at which point you can refill at a drinking fountain and take with you on your flight. Does it fit in the seat back pocket of an airplane? Yes, the compressible silicone body collapses flat enough to fit into airplane seat back pockets, making it a convenient travel accessory. Simply slide the hard plastic sleeve to the top and twist-open the cap to deflate. The less water and air inside, the more your bottle can be squished down. Alternatively, you may be able to use the attached strap to hang your bottle from the tray latch (varies by airplane model). Does it fit in bike bottle cages, car cup holders and bag pockets? At 2.9 inches (7.4 cm) in diameter (with the hard plastic sleeve) and 10.5 inches (27 cm) tall in its non-folded position, your Nomader bottle *should* fit in most standard size bottle cages, cup holders, and backpack side pockets. For tight pocket spaces, due to the grippy nature of silicone, you may find it easier to slide in and out by packing in a nylon or neoprene water bottle carrier bag. What’s the purpose of the strap? Is it removable? The multi-function fabric carry strap makes it easy to tote around your bottle when on-the-go, secures your bottle in its folded position for compact storage, and can attach to your backpack with a carabiner. The strap is not designed to be removed. How/where do I attach a carabiner to this canteen? 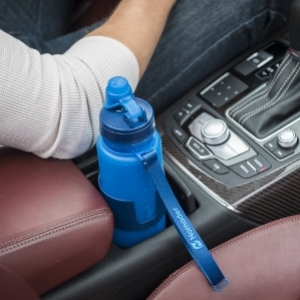 Depending on the carabiner’s size and what you intend to attach to, you can clip it to three different places on your Nomader; 1) the strap, 2) the plastic ring that the strap connects to, or 3) the spout hinge on top of the bottle. The other alternative is to use a water bottle carrying pouch, some of which come with webbing, loops, and buckles to easily attach to backpacks, messenger bags, and other travel gear. What are dimensions, weight and capacity for this vessel? Are Nomader water bottles BPA free? Yes, Nomader bottles are made of 100% BPA-free food-grade materials, compliant with FDA and LFGB safety standards. Click here to learn more about BPA (Bisphenol A). Additionally, Nomader bottles are free of BPS (Bisphenol S), lead, PVC, latex, phthalates and other harmful leaching chemicals. Use a soft-bristled water bottle cleaning brush with hot dish soapy water to gently scrub the interior of the silicone body and the plastic lid and cap. Rinse thoroughly, and air out to dry with lid removed. When travelling, hiking, or camping, we recommend using water bottle cleaning tablets. To use, simply fill your bottle with warm water, drop in a tablet, let fizz 20-30 minutes, rinse thoroughly, and air out to dry with lid removed. Fill half way with hot water, add 1-2 drops of dish soap, close, shake vigorously, empty and rinse out. Fill half way with hot water (no soap), close, shake vigorously, empty, rinse thoroughly, and air out to dry with lid removed. Place bottle on top rack with the lid separated, aiming the silicone body's mouth opening downward. Secure the strap so that it doesn't dangle onto the heating element. Please note: although Nomader bottles are dishwasher safe, you may find our other suggested cleaning methods to be more effective. I’m allergic to latex. Are there natural rubber parts in the cup? The Nomader Collapsible Water Bottle does not contain any latex or natural rubber. Furthermore, no latex or natural rubber (including rubber gloves) is used during manufacturing and assembly. The container's body is made of food-grade BPA-free silicone rubber. The cap, lid, mouth, and sleeve are made of food-grade BPA-free polypropylene (PP) plastic. The fabric carry strap is made of polyester. Can I use this as a hot water bottle? Nomader bottles support temperatures as hot as 248°F (120°C), which is beyond boiling. Always use caution when handling hot drinks. The insulated plastic sleeve is designed to help protect your hand. Microwaving is not recommended as some parts may warp. Is the entire bottle freezable? Nomader bottles are rated for temperatures as cold as -4°F (-20°C), making it freezer safe. Fill no more than 3/4 of your bottle (about 18 ounces or 530 ml) before placing in the freezer since water expands as it freezes—failure to do so may result in damage to your bottle. Does this water bottle sweat a lot? How insulated is it? It is not considered an insulated water bottle. The greater the temperature difference between the liquid inside and the ambient air outside, the more condensation will occur. 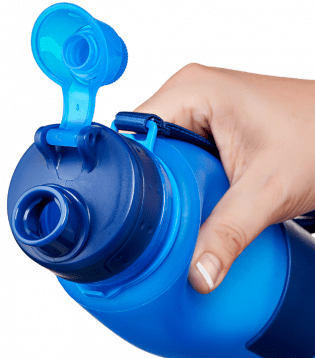 However, because of the bottle's thick silicone body, it is not as prone to sweating as some other non-insulated bottles. If you’re looking for fully insulated, check out the double walled stainless steel water jugs from Hydro Flask and Klean Kanteen. Is this water bottle environmentally friendly? The body of the Nomader bottle is made of 100% BPA-free silicone. When it comes to the environment, silicone is highly durable (resists normal aging for decades on end), is non toxic to aquatic or soil organisms, is non-hazardous waste, and can be recycled after a lifetime of use. Once recycled, silicone is converted back into inorganic, harmless ingredients: amorphous silica, carbon dioxide, and water vapor. 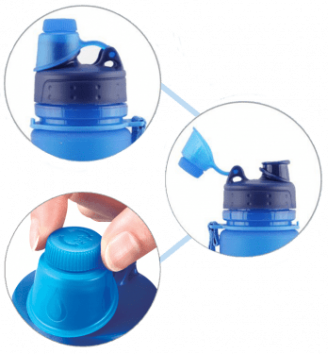 The Nomader bottle’s lid, mouth, sleeve, and strap ring are made of #5 PP recyclable plastic. What's the best way to clean my Nomader bottle? Any other suggestions for maintaining a fresh taste? Drop in some lemon slices or lemon juice for a healthy and refreshing flavor. Lemon juice is also a natural safeguard against bacteria. Where possible, fill your bottle with fresh filtered water to drink from, available in most airports, hotels. restaurants, and cafes. Unfiltered tap water has bacteria and chlorine, which can cause a stale odor and taste in silicone bottles. Replace water that's been stagnant in your bottle for several hours or days, especially in hot and humid environments where bacteria runs rampant. For maximum freshness, periodically fill your bottle with equal parts lemon slices (or lemon juice) and filtered water, soak overnight, wash, rinse, and air out to dry. We proudly stand behind the quality of every Nomader bottle we make. To show our commitment to quality, we offer a lifetime warranty that covers the repair or replacement of manufacturing defects for the lifetime of the bottle. To learn more about our warranty policy or to file a claim, please visit our Warranty page. We offer a 100% satisfaction guarantee. If you're not totally happy with your Nomader bottle, simply return it to us within 90-days of your purchase date for a full refund or exchange. To be accepted, your bottle must be returned clean, empty of any liquids and in its original packaging. For return instructions, please submit your request through the form on our Help page. Where can I buy authentic Nomader bottles? The easiest and safest way to buy authentic Nomader water bottles is through the “shop now” buttons on our official website at www.nomader.com. What are counterfeit Nomader bottles? Counterfeit Nomader bottles are imitations or fakes that are illegally created and sold by third parties to trick people into believing that they are authentic. These counterfeit products are not held to Nomader’s high quality standards in design, engineering, manufacturing, testing, and health safety. What if I bought a fake by mistake? If you bought a counterfeit Nomader bottle, you should demand a refund from the seller. Please also report the fraudulent seller to us through the contact form on our Help page—we will reward you with a discount on an authentic Nomader bottle. Yes, Nomader bottles are available to be decorated to match your branding to be used as a promotional item for your corporate events, employee or client gifts, etc. Choose from a variety of bottle colors to compliment your logo, which can be imprinted on the bottle's hard plastic sleeve. Please visit our Co-Brand page for more details. Will frequent folding cause damage to the flask? Nomader bottles are made of durable and flexible BPA-free silicone, designed for rolling, bending, collapsing, and folding. If you notice any creases caused by prolonged periods of being rolled up, it is only temporary and will smooth out as you put your bottle back into use by inflating and filling with water. How do I prevent the clip from unhooking once folded? 1) Slide up the plastic sleeve so that its lower inner edge of the "U” meets the seam line in the silicone body, located right below the plastic latch. 2) Fully delate the bottle by opening the cap and squeezing to release the air. 3) Roll up the bottle tightly before attaching the strap clip to the plastic latch, and then allow the bottle's natural tendency to unfold to put tension on the strap and latch. If these directions aren't successful for you, it's possible you received a defective bottle which is fully covered under our Lifetime Warranty. If you need to make a claim, please visit our Warranty page for assistance. Why is Nomader the best collapsible water bottle? Retains its sturdy shape when drinking from it. Others awkwardly collapse in your hand. Stands on its own whether filled or empty. Others fall over and tumble too easily. Locking twist cap ensures no leaks. Others tend to leak at the worst moments. Spout is protected by hygienic cover. Others expose the spout to germs and dirt. Made of long-lasting, durable silicone. Others break down after minimal use. Handles hot, cold, and frozen drinks. Others are made for cold water only. Wide mouth makes it easy to refill, add ice, and clean. Others come with narrow opening. Easy to carry or clip with attached lanyard. Others offer no means of carrying or attaching. Large 25oz capacity keeps you hydrated longer. Others need refills after a few gulps. Includes a lifetime warranty. Others only include a limited 1-year warranty. Nomader bottles are currently available on a limited basis for select domestic and international retailers to carry. Please visit our Wholesale page for more details.